Hello my lovely readers and friends! It's the last day of May and I really wanted to squeeze this post in because May is Brain Tumor Awareness Month. I wanted to post this earlier but totally forgot and realized today that it's the 31st. So basically Marisa from Polish Obsession started a nail art contest on Instagram. The theme was Grey for Brain Tumor Awareness Month. I had to take part because it was an awesome contest and because this is an important cause. Here's what I came up with! 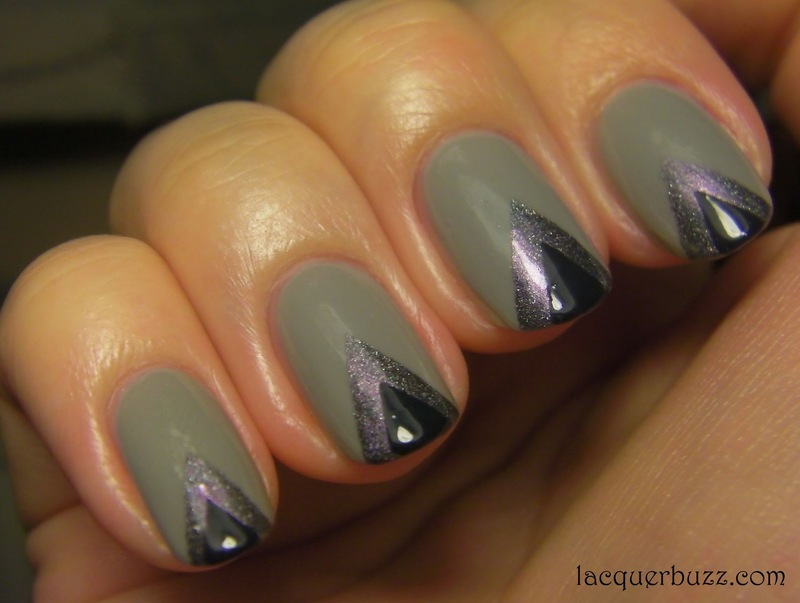 This chevron mani was done using scotch tape and was inspired by the amazing Nailside. I started with a base of Golden Rose 134. This is the only true grey that I own and it's very sheer. I had to do about 3-4 coats to get it to look decent. I really have to get some good grey cremes. I then put some fast drying top coat on and waited for it to fully dry. 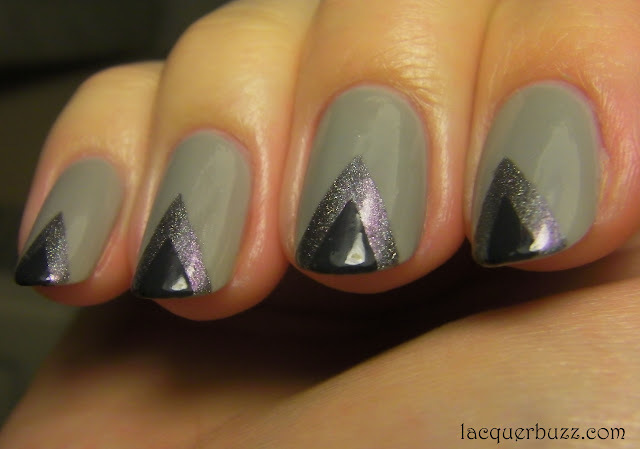 After it was dry I taped a triangle in the middle and filled it in with a-england Ascalon (swatches coming soon). Finally, after it was dry, I taped a smaller triangle and painted it with Hello Kitty Blackstage, a really dark grey creme. Topped everything with top coat and that's it! For some reason this photographed better outside the light box so the rest of the pictures will be in direct light. This looked so cool and really made my fingers seem longer. Sadly I broke a nail while I was wearing this so I had to cut them all off. I'm back to shorties now and I don't mind too much. I forgot how easy it was to go around with short nails. 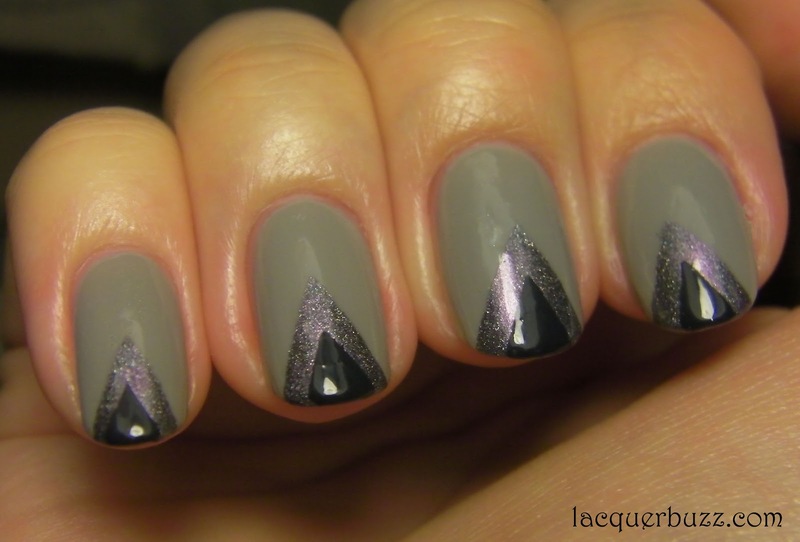 I hope you liked my grey mani! To find out how you can help the cause make sure to check this link out! Hello my lovelies! How are you all doing today? For today's Monday Blues post I have something a bit improvised. I was going to post Kleancolor Holo Chrome but I found out yesterday that people call that one a purple. So I had nothing. I desperately went trough the pictures on my computer to see if there was something unposted. Luckily, I found the swatches of this lovely polish. It has been named turquoise, aqua and whatnot but I think we can all agree it's more blue than anything else. So here it is! 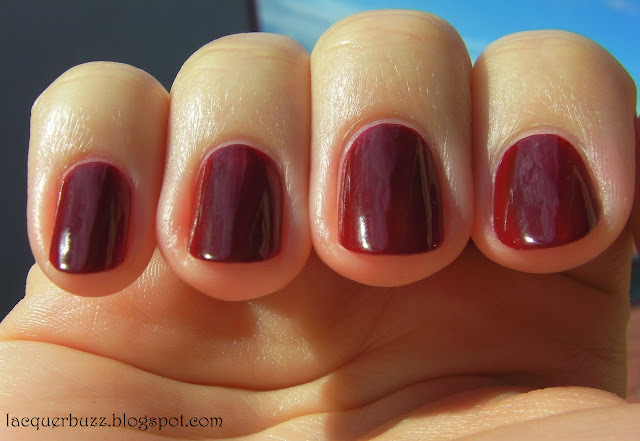 I've had this polish for about a year but never posted swatches on my blog. It comes from the 2010 Up & Away collection and boy do I love it! It's very hard to describe because it looks different in pretty much every light and time of the day possible. A hint of green might be visible at times but mostly it's blue. Vibrant, glossy and amazing! It's very pigmented but I still needed 2 coats to get it even. My pictures have no top coat and look at that shine! I would say I have a soft spot for spring collections and this one from China Glaze is one of my favorites. The formula on most of these is top-notch and just a pleasure to apply. Gosia from Life in Color! Hello loves! Happy Sunday! I have a very exciting announcement for you today! Lacquer Buzz finally has its own domain! So from now on you can find my blog on lacquerbuzz.com. I can't believe how easy it was to make the transition. The following 3 days or so will be a little problematic because of the transition and the new address might get some errors. The old address is still working and will be redirecting to the new one so no worries. I'm still on blogger so GFC is still working. 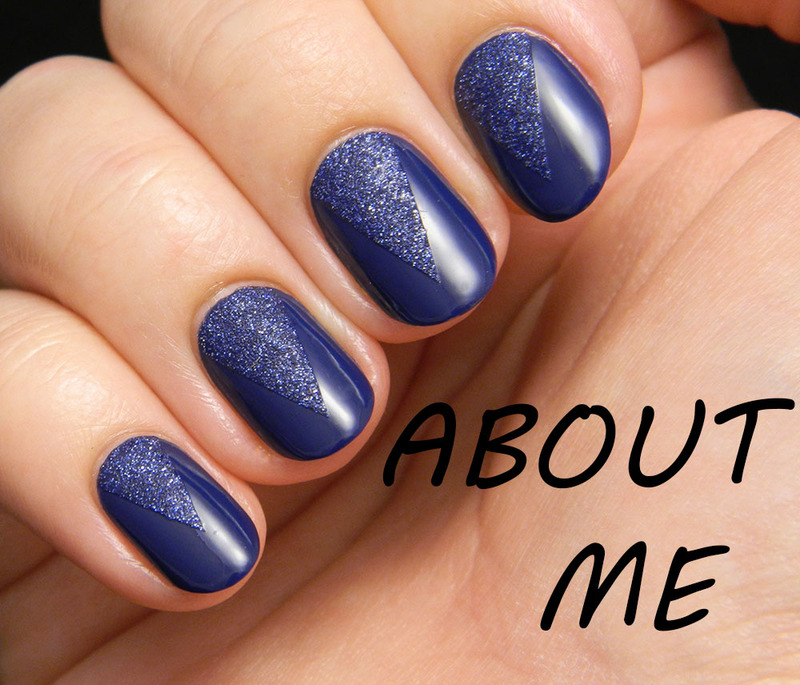 Also don't forget you can follow me via Bloglovin, Facebook, twitter and Google+. Check out the buttons on the left sidebar for all the links! 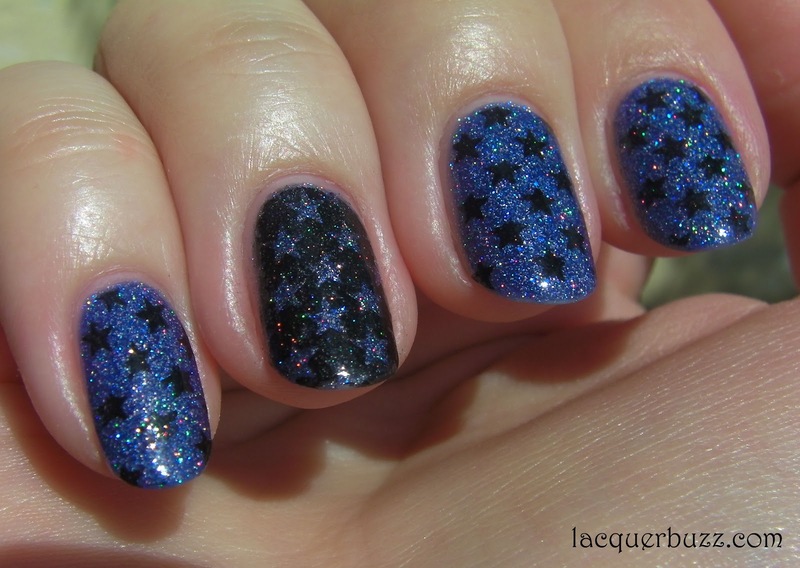 Today's post is about a gorgeous Kleancolor glitter. There's actually a funny story about this because I regarded it more as a blue but found out today that most people see it as purple. I guess it's a blurple so that makes everyone happy. 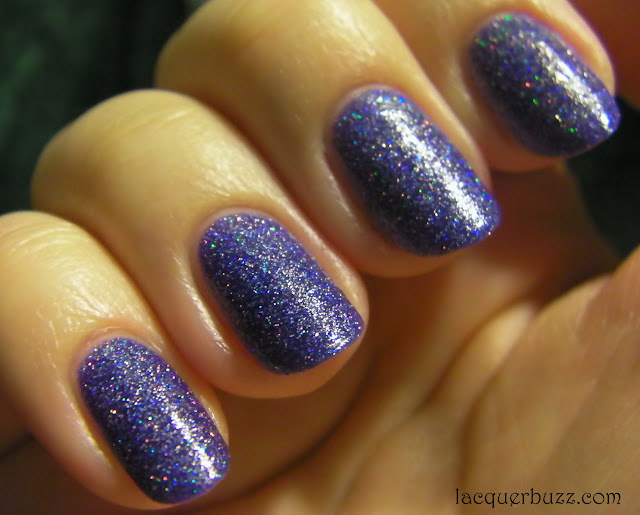 Holo Chrome is a fine blurple glitter with a few larger blue pieces mixed in. It's not that dense so you will need at least 3 coats to get it opaque. Even at 3 coats there was still some visible nail line in certain lights. You can use some underwear polish if you don't wanna do so many coats. My pictures show 3 coats without any underwear. What made me sad about my pictures of this was the fact that I couldn't capture the holo effect properly. The picture above is slightly blurred and only shows part of the holo. For some reason it was much stronger under my bathroom light so I snapped a picture in there too. I don't usually do that but temptation was too strong. I used a fast drying top coat over this because it doesn't dry very fast. It's also a top coat eater. It was still gritty after 2 coats of it so I would say a thicker one is in order if you wanna make it smooth. Luckily I'm not too obsessed with that. I also did some stamping over it on the second day. I used stars again because I'm obsessed with them. The accent finger is stamped with QA18 and the rest with QA17. 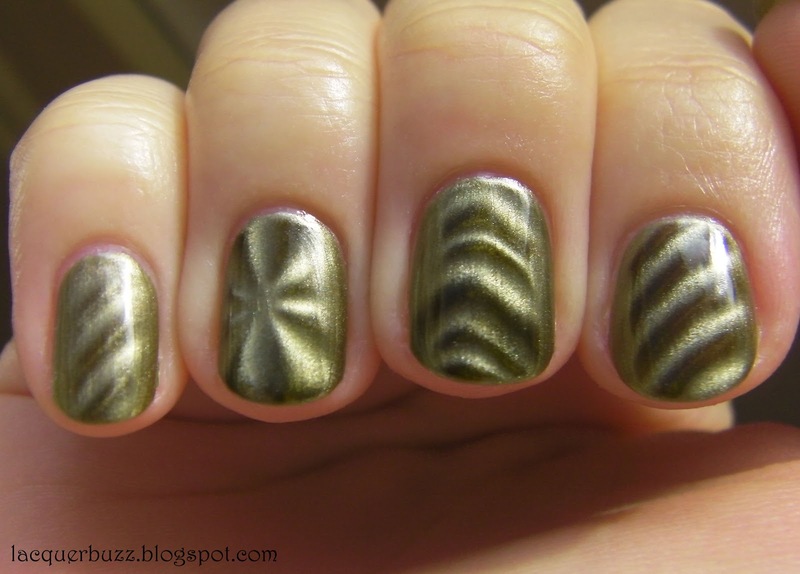 The stamping polish is China Glaze Liquid Leather. I really love how crisp the lines on the ring finger came out. I tried it with Kleancolor Metallic Black first and it was a mess. These photos are in full sun so they show the holo a bit better. Removal is very hard on this one so the foil method is mandatory. I think I will try using it over a blue or purple next time. All in all I really love this polish and I think it's great value for money. What do you think? Do you see it more as a purple or as a blue? Hello loves! TGIF! Today's post will be a short one because I'm really tired and not very talkative at the moment. You guys might know by now that I love subtle stamping. This is a manicure I did when my Cheeky plates first arrived. I was wearing OPI Mermaid's Tears so I quickly picked two stamps I liked and slapped them on. I sure loved the result! I used plates CH16 for the accent nail and CH5 for the rest of the fingers. 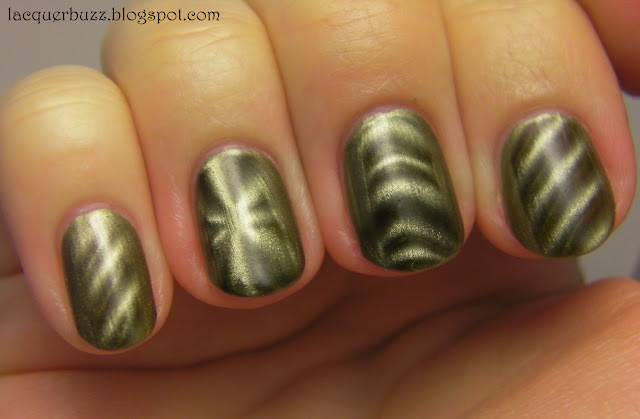 The stamping polish is a-england Excalibur. You might have noticed I use this polish a lot and that's because it stamps amazingly. I won it in a giveaway on Marisa's blog and I'd like to thank her again for it! I tried to take pictures of it swatched 2 times but I wasn't happy with them at all. My photos show all the streaks that are not visible in reality. So I think this one will remain unswatched on my blog. There are several posts about it on famous blogs so you can google those. 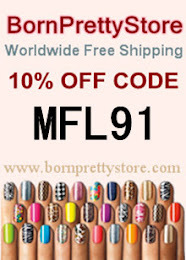 It's an amazing polish, opaque in one single coat and very durable on the nails. I really loved this manicure and I was sorry to take it off. I just love Mermaid's Tears so much! It's definitely one of my top 10 polishes if not even one of the first 3. It's also very special because of the trouble I had when I was trying to get it. 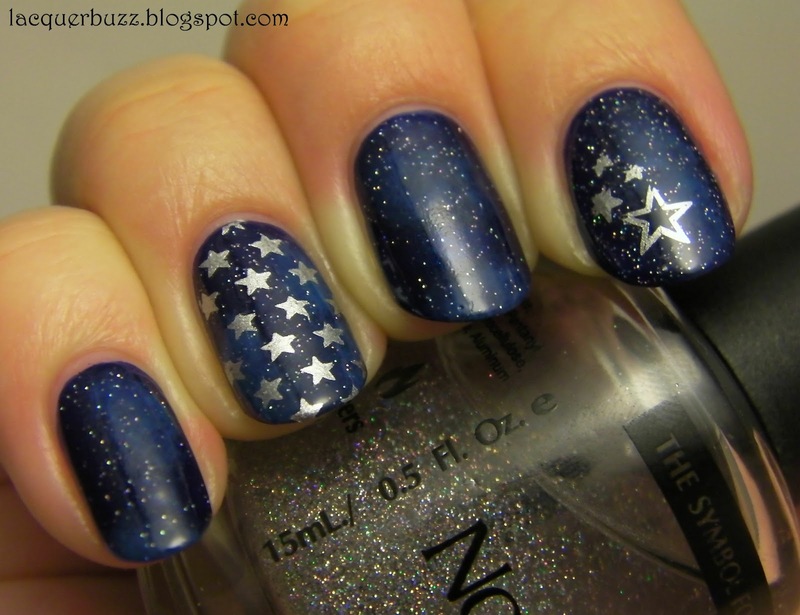 So what do you think about this mani? 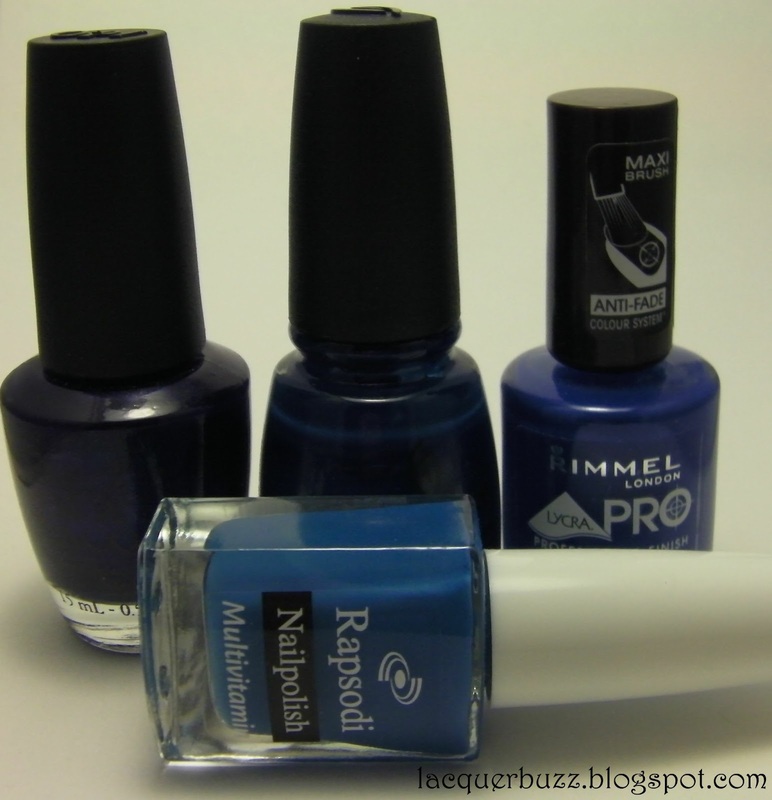 Are there any polishes that are special to you for some reason? Hello my lovelies! I don't know about you, but I'm so glad this week is almost over. It was a hectic week and I can't wait for the weekend to rest. 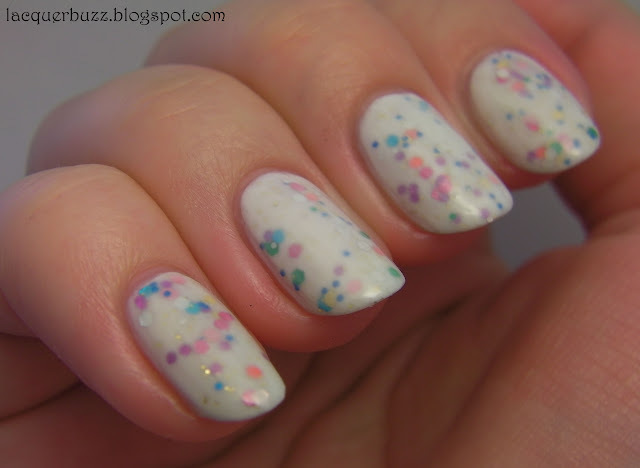 I have a fun post for you today, featuring a multicolored glitter. I've been wanting to get one of these for a long time and now I have not one but two of these. They are similar but not identical and I don't regret getting them at all. The other one is NYX Carnival but today I'm showing you the Essence one. 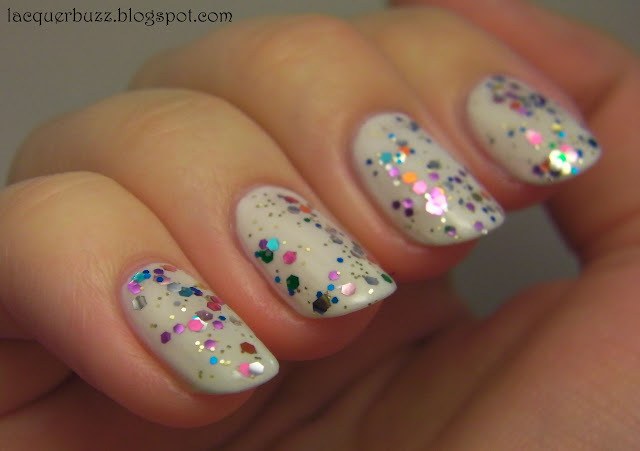 Circus Confetti is definitely a layering glitter. It might get opaque using several coats of it, but I personally don't like the look of that. So I layered it over 2 coats of Farmec 50. I only did one generous coat of Circus Confetti and I tried to arrange the glitter with the brush so that it wouldn't all sit in one place. Circus Confetti is made out of large and medium multicolored hex glitter and small gold glitter. It's not very dense but not too sparse either. I would say it has the perfect density for layering. Since Farmec 50 is pretty sheer, I decided to layer another coat on top of the glitter to make a sandwich. It came out a little more milky than I would have wanted, but it looked much better in reality. I'm so sorry that this didn't photograph that well. I'm crazy about glitter sandwiches but I don't have many jelly polishes to play with. This is more of a milky white. I love how the glitter seems suspended in the milkiness. 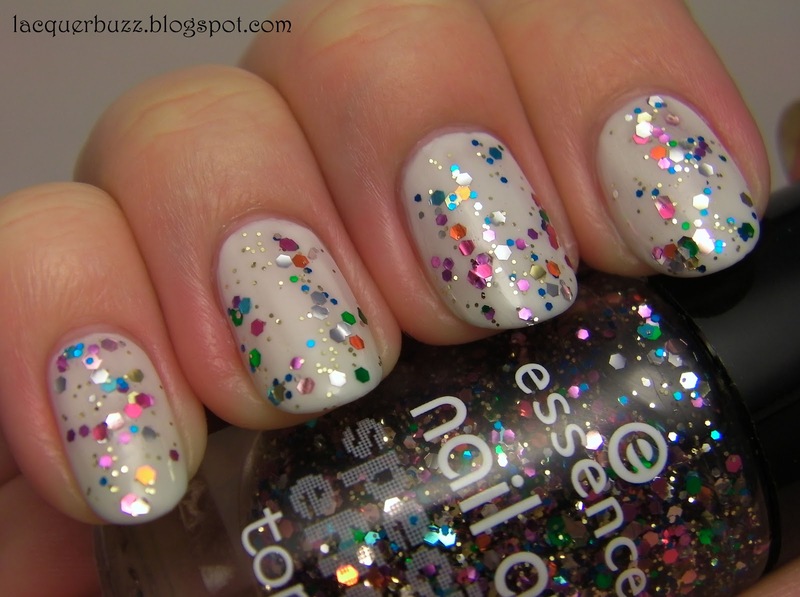 So what do you think about multicolored glitters? Are they too much or just right? And what about glitter sandwiches? I just love them! Hello my lovelies! 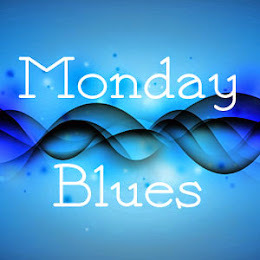 I don't know what it is about Mondays, but they never start good for me. I sure hope the rest of the day will be better. But not to worry! I have a beautiful blue to show you. Excuse the weird formatting of this post, but blogger is being a scumbag today. I will try to fix it later. 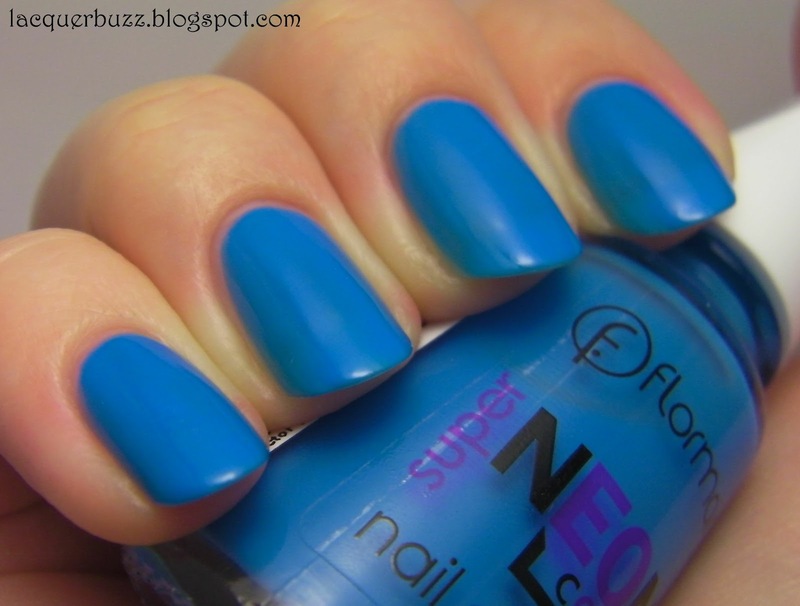 This polish comes from the Flormar Neon Colors collection. I'm not sure how a blue neon should look like, but this is a very bright color. The problem is the sheerness of it. I really thought I could make it opaque in a few coats so I kept piling them on but I wasn't very lucky. This is 4 coats and there was still some visible nail line. I don't think I have ever done 4 coats of a polish in my life. Next time I will make sure to use some white polish underneath. The formula on this one is ok except for the sheerness. It applies well and dries pretty fast considering I did 4 coats. I know neons are supposed to dry a bit matte but this one dried very very glossy. All the pictures are without any top coat. I wanted to use this polish as a base for my second sky themed manicure for Sunday but it was a total fail. Besides the white not stamping very well, I had the idea of coloring the balloon and it totally ruined it. 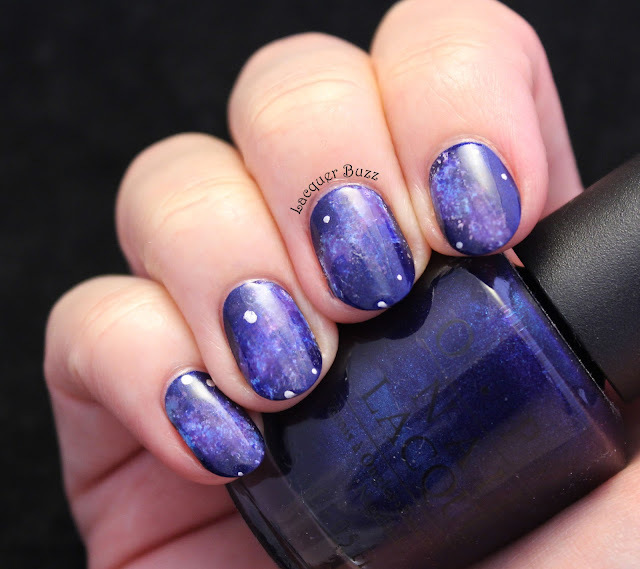 I stamped the clouds using plate m79 and a white random stamping polish. 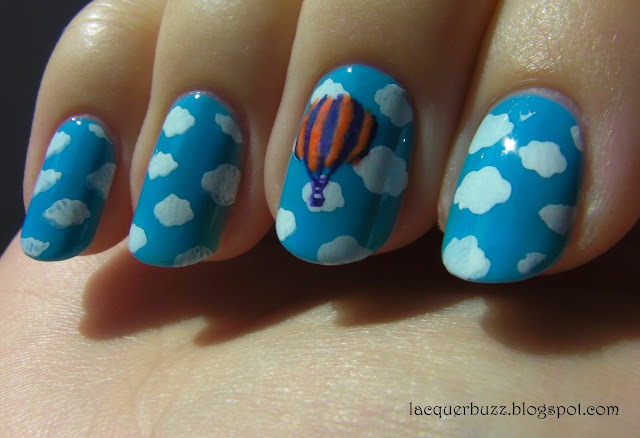 The balloon is from plate FUN 2 from Fab Ur Nails. I stamped it with a purple Opoola stamping polish and then filled it in with Rimmel Tangerine Queen. Despite it being a fail, I will still include a picture of it here. Hello my lovelies! Hope your weekend is very relaxing and fun. This Sunday's theme in Adventures In Stamping was "the sky's the limit". We could use our imagination and do whatever sky related stamping manicure we wanted. I had 2 ideas for a night and a day sky but the day one didn't come out that good so I'm not sure if I will post it. The night one turned out great in my opinion and I liked it a lot. 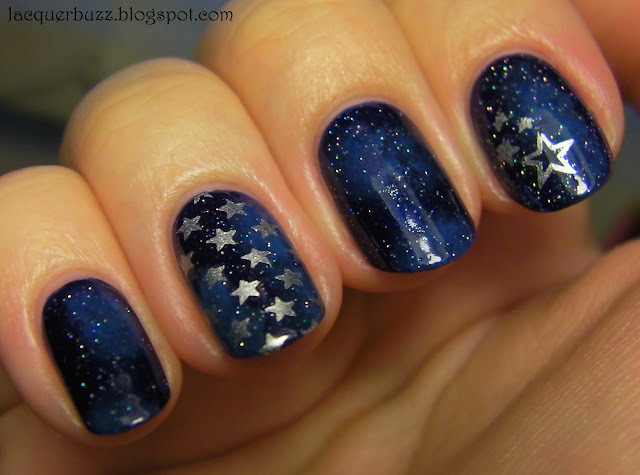 There are a lot of versions of the "galaxy nails" online but I decided to do some night sky nails instead. I started with a base of OPI Yoga-ta Get This Blue and used several blue polishes to sponge over it. Here's a picture of all the blues I used. I used a makeup sponge tip applicator and started with the darkest color (First Mate). I sponged randomly to imitate the clouds on a night sky. 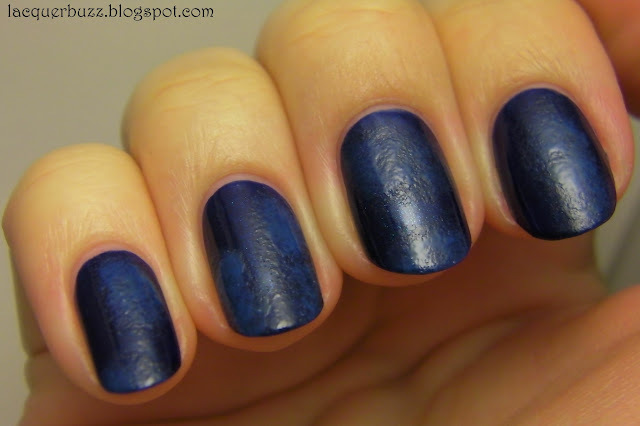 I then sponged with My Denim and finally with the lightest Rapsodi on top to give dimension to the sponging. Here's how it looked after this step. 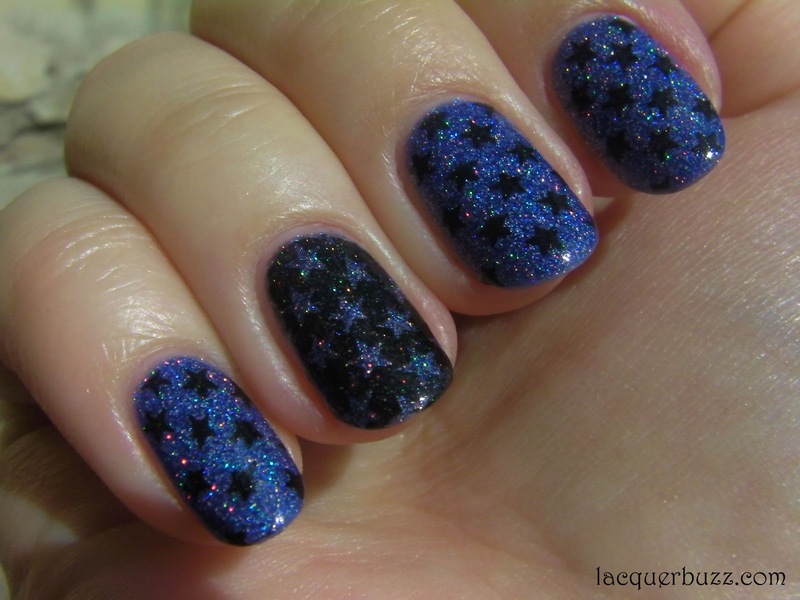 Next I used a coat of INM Out The Door to level everything out and add a holo glitter for the starry sky effect. This is how it looked. 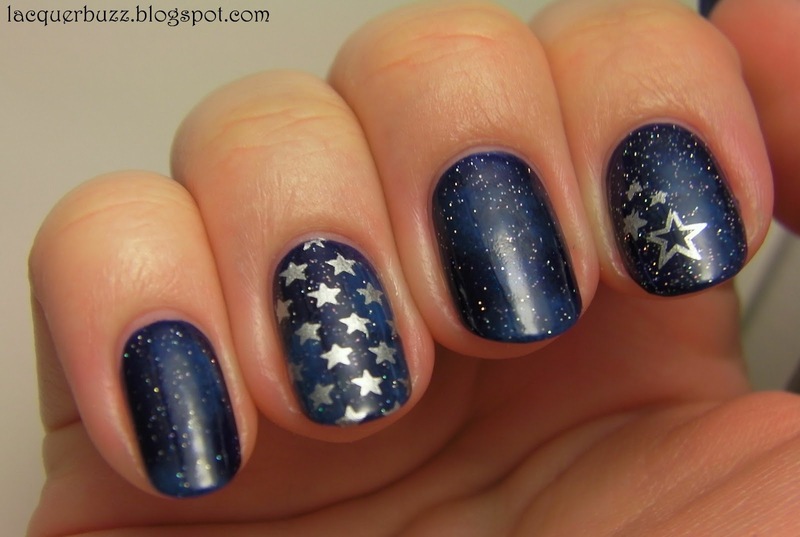 Finally I stamped some stars using my new Cheeky plates and a-england Excalibur. Both images are from plate CH4. You will be seeing a lot of stars in my manicures in the future because I love them! 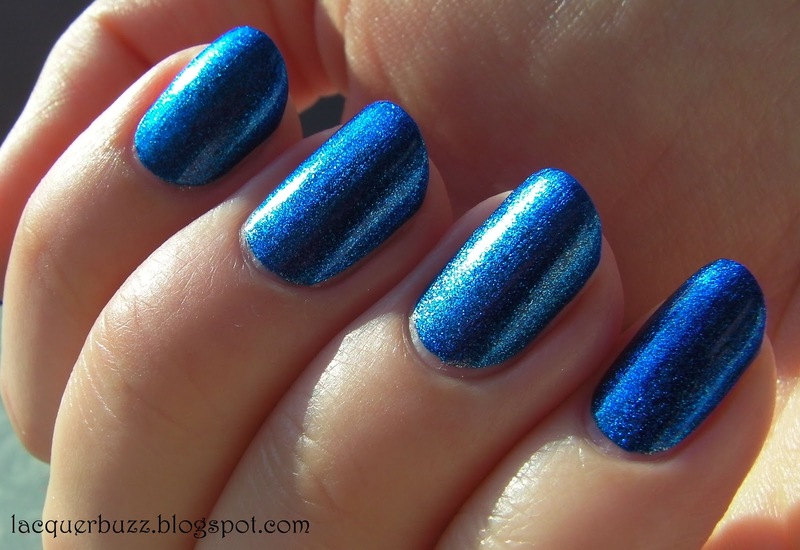 You can see a hint of the holo effect of this mani in the following picture. I hope you liked this as much as I did and I can't wait to read your opinions on this mani. Have a great weekend! Hello my lovelies! It's Friday! And that means a whole weekend of relaxation and playing computer games for me. I got the new Diablo and I love it and play it non-stop. 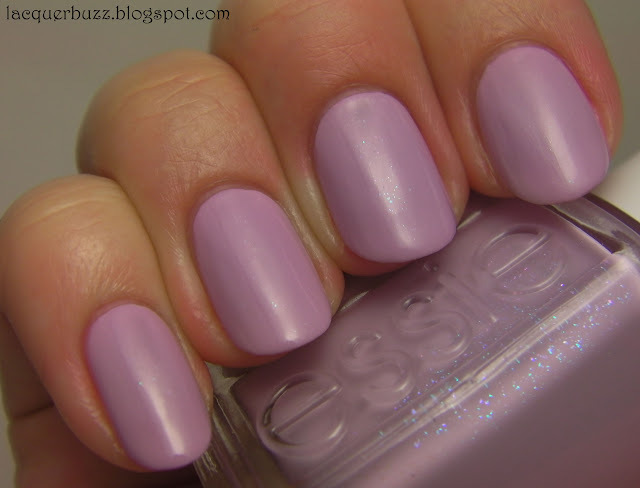 Today's post is about a polish from this year's Essie spring collection. It's the first Essie polish that disappointed me. Let's take a look! TBONTB (I'm not that crazy about the long name either) is a lovely pastel lilac with a very interesting blue shimmer in it. Of course the shimmer is more evident in the bottle but I already expected that to happen. You can still see it a bit up-close on the nails (especially on the middle finger). The problem I encountered was the formula. It's very thin and watery and sheer. It needed 3 coats for opacity but even so it didn't apply well at all. The wateriness made the application streaky and impossible to level out. I just gave up after 3 coats because I never do 4 coats for a polish. You can see that there's a huge bald spot on my middle finger. I tried to cover it but it was impossible. The streaks are not that evident in the pictures but they made me crazy. So I decided to use glitter because glitter makes everything better. I sponged the tips with Rapsodi 20, which is a larger size holo glitter and topped everything with a coat of INM Northern Lights (a finer holo glitter). Northern Lights is my go to polish for saving a manicure because it also levels out any unevenness and makes the mani fry faster. Plus it's a holo glitter, of course! I ended up loving this mani but I'm not sure about this Essie polish. All the Essies I own have top-notch formula and even the lighter ones apply like butter. I didn't spend any money on it because I won it in a giveaway, but still. This makes me think the Essie formula is not that foolproof. Does anyone else have this polish? Did you have the same issues or maybe I got a dud? Let me know! Hello loves! This will be a shorter post because I have to get back to the hospital soon. I'm on call this afternoon and I can't wait for the day to be over. I really wanted to get this post up today though. 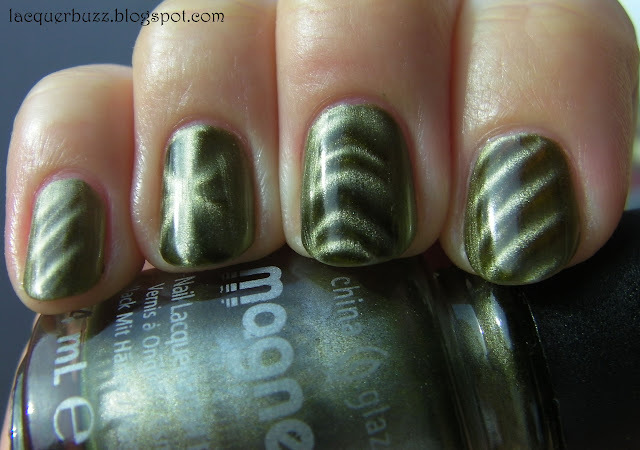 You might be already sick and tired of magnetic polishes but I'm not. This is also an unusual shade and it's fun to look at. Cling On is a light green metallic shade that is more on the grassy side. It looks slightly different depending on the light so I included a bunch of photos with different light settings. It's pretty sheer but I managed to get it opaque in 2 coats. I used all the China Glaze magnets on different fingers for a bit of variation. It applied like butter and dried very fast, which is always a plus with metallic polishes. I wore this manicure during my week of studying hell. I had it on for 7(!!) straight days. That's a lot for me. I wasn't really in the mood to change my polish and my time was limited. It didn't chip at all during this time. It only had a bit of tip wear when I finally removed it. 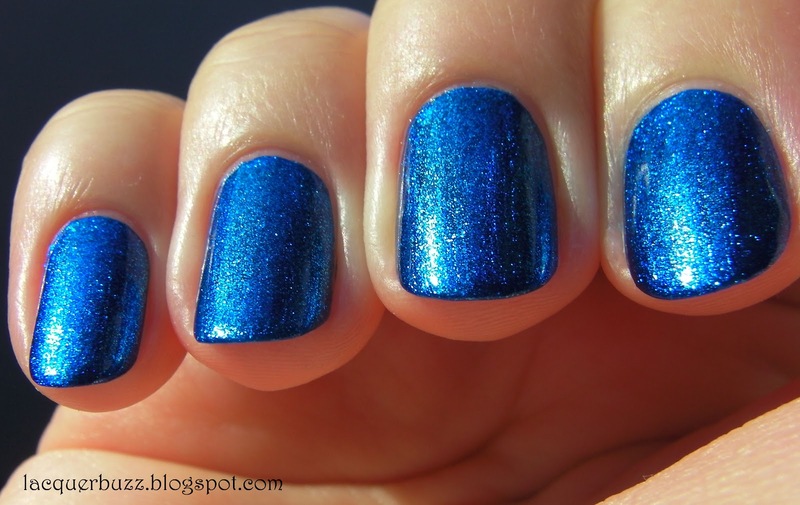 So what do you think about this polish? Are you already over magnetics? I must say I love the shade and the name a lot! And the great formula is always a plus. Hello my lovelies! How are you all doing today? I'm determined to get up to date with the posting so I'm gonna try to do more posts this week. I have some older manicures from these past weeks to show you so that's why my nails will be shorter in these posts. I'll start with one I wore during my first exam. It's more of a fall color but also a classic and classics can be worn all year round. I chose to wear this because I wanted something a little less crazy to wear on the day of the exam. I'm so not used to wearing these type of colors and I couldn't wait to take it off and paint something fun instead. 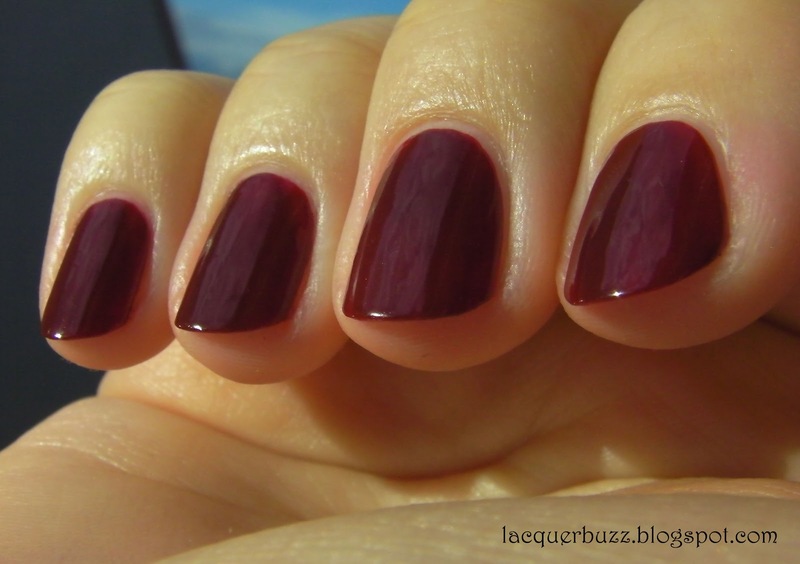 Don't get me wrong, this is one of my favorite colors but it has become redundant on my nails. As most H&M polishes do, this had a really thick formula. I knew about that and dropped about 3 drops of Seche Restore in it before using it. Unfortunately it was not enough and the first coat went on too thick. I then added another 3 drops and painted the second coat which was perfect. By then there were already bubbles in the first coat and there was nothing I could do about it. It dried fast to the touch but was still dentable for a long time so I had to use a fast drying top coat in the end. 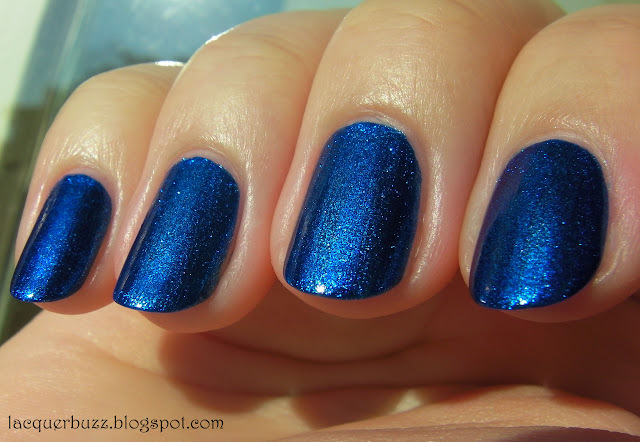 The photos are without top coat and you can see the shiny crelly finish of this polish. I really like this shade because it looks better on me than China Glaze Velvet Bow, which looks a little too brown. Durability was not the best but it would have probably been better if the first coat wasn't so thick. So what do you think of this polish? Are you a fan of these classic shades? I admit I would have liked it better if it was fall or winter. Hello my lovelies! Hope your Monday is going better than mine. We've got really crappy weather out here and it got really cold. I was literally freezing all day. Luckily, my Cheeky plates arrived today so I get to play with them after I finish this post. Today's Monday Blue is a real bomb. I was really amazed the first time I swatched it. So be prepared! Hello gorgeous! The main reason why I got this polish was because I knew these stamped really well. Little did I know that it would be utterly amazing on its own. By the way, I got it from Beauty Joint, the only shop that ships these to Romania. If you know of other shops that sell Kleancolor to Europe please let me know. 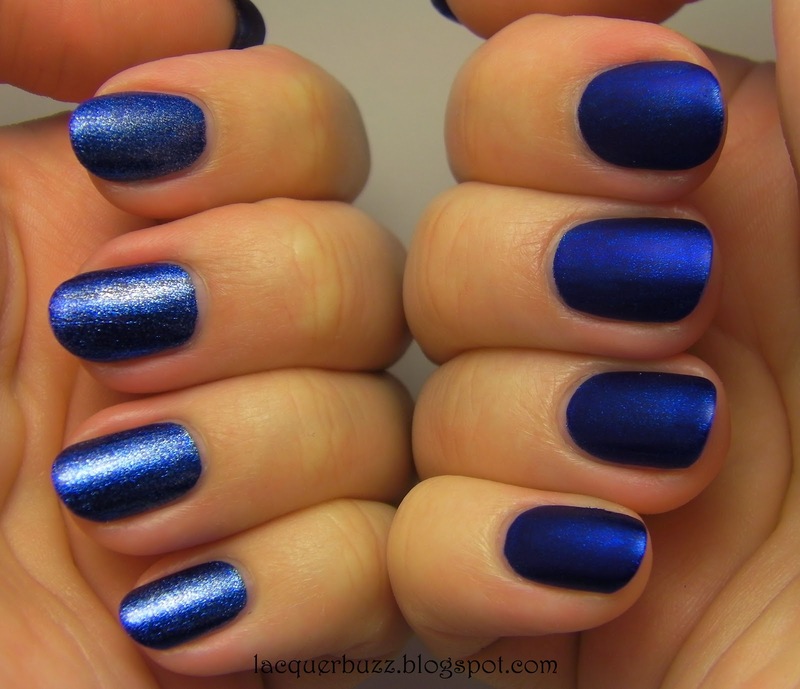 So basically this is just a metallic blue, as the name says. But it's so much more than that! It has a darker blue base with silver metallic particles in it. The effect is so sparkly and unique! It's so beautiful that I didn't even want to cover it with any top coat. I wore it by itself for one day and didn't get any chips. Just a bit of tip wear. Another great thing about this polish is the application. It was opaque in one single coat! It has great pigmentation and a great formula that makes it glide on the nail like butter. The brush was a little uneven but nothing too disturbing. I've also heard a lot of people complain about the smell of Kleancolor polishes. I don't think that the smell is so strong, especially compared to polishes with toluene in them (like W7 or Gabrini), but I did notice a smell that is different from any other polish I have. Maybe that's what some people are bothered by. 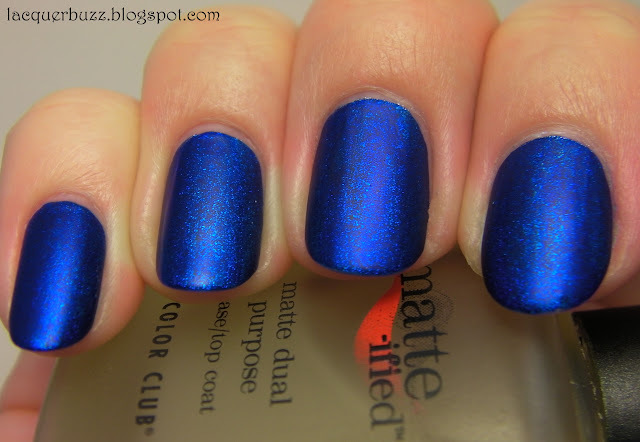 Of course that being obsessed with matte polishes, I had to try it with one coat of Color Club Matte-ified. Unfortunately it took away a lot of the sparkle this way. It's still pretty with a more subtle look though. The only thing that is not great about this polish is the staining. Considering it's on the cheap side and it has such an amazing pigmentation, I would say that it's forgivable. Just make sure you use plenty of base coat and be careful when removing it! If you want to join us please let us know!